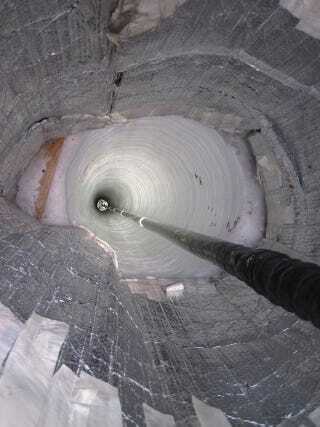 The IceCube Neutrino Observatory, built over a decade at a cost of $271 million, is buried under the South Pole... and longer than the world's tallest skyscrapers combined. Late last week construction of the IceCube Neutrino Observatory wrapped up at the National Science Foundation's Amundsen-Scott South Pole Station in Antarctica. The team of international scientists behind the effort have come up with something truly remarkable in building the world's largest neutrino observatory. The massive telescope, which is the size of a cubic kilometer and located 1400 meters underground, took a decade to build and cost approximately $271 million. Oh, and if you lined up the world's three tallest skyscrapers, their collective height would be shorter than this telescope. IceCube is operated by the University of Wisconsin-Madison and the National Science Foundation, with funding provided by the United States, Belgium, Germany, and Sweden. Researchers from Barbados, Canada, Japan, New Zealand, Switzerland and the United Kingdom are also involved in the project. For IceCube, construction at the South Pole all came down to their scientific goals. The observatory is designed to find extremely high energy neutrinos—tiny subatomic particles—originating from supernova explosions, gamma-ray bursts and black holes, with an emphasis on expanding humankind's knowledge of Dark Matter. Neutrinos, according to current scientific theory, play a crucial part in detecting Dark Matter. The IceCube Observatory is designed to detect a blue light, called Cherenkov radiation, created by the nuclear reactions of individual neutrinos crashing into ice atoms. Cherenkov radiation is generally considered to be the equivalent of a sonic boom for light. Building the Observatory at the South Pole offered the opportunity to use some of the world's clearest and purest ice, minimizing any risk of distorted experiment results. According to the IceCube Observatory team, building the telescope required an existing scientific station nearby for logistical purposes—which is how the project ended up become constructed adjacent to the United States' South Pole complex. Construction of the IceCube telescope, as you might imagine, was an engineering feat. University of Wisconsin scientists built a customized hot water drill capable of penetrating more than 1.2 miles of Antarctic ice. These multiple deep holes in the Antarctic ice were then filled with sensors and support equipment. Each hole took approximately 48 hours to drill. All telescope components, employees, contractors, equipment and food were flown to Antarctica and then delivered on ski-equipped C-130 planes from McMurdo Station to the South Pole, an approximately 800 mile flight. Approximately 150 specialists worked in construction and logistics at the South Pole over the past decade, with the bulk of the work being done in round-the-clock shifts during the Antarctic summer. A small, hardy skeleton staff remained at McMurdo Station during the unimaginable South Pole winters. During the years of construction, the University of Wisconsin posted a detailed guide to life at the South Pole, which praises the recreational opportunities at the South Pole station while (understandably) groaning at the weather. The finished observatory is longer than the Petronas Towers, the Empire State Building, and the Willis Tower/Sears Tower combined.